Covered by one or more of the following patents: 5,687,066 5,600,550 5,982,643 6,184,649 - One or more additional patents pending. 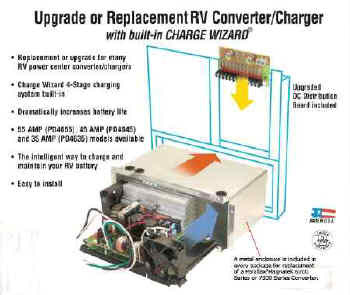 Inteli-Power 4600 Series models can recharge the battery to 90% in 2-3 hours using our patented Charge Wizard technology. The built-in Charge Wizard automatically selects one of four operating modes: BOOST, NORMAL, STORAGE, DESULFATION. BOOST Mode 14.4 Volts - Rapidly brings RV battery up to 90% of full charge. NORMAL Mode 13.6 Volts - Safely completes the charge. STORAGE Mode 13.2 Volts - Maintains charge with minimal gassing or water loss. DESULFATION Mode 14.4 Volts every 21 hours for a period of 15 minutes to prevent battery stratification. Weight 8 LB. 9 OZ. 8 LB. 9 OZ. 8 LB. 9 OZ.